More and more people choose to make their purchases online as the relationship between businesses and consumers continues to change. In 2017, nearly 1.7 billion people across the world shopped for their goods online. This attraction to online shopping should worry traditional retail store owners. Brick-and-mortar store owners now more than ever need to find ways to connect to and attract in-store customers. Cultivating a unique shopping experience can encourage loyal and potential customers to visit your physical store rather than purchasing online. One way to do this is to combine the physical and digital into a diverse, multichannel experience. Do this by incorporating digital signage displays into your store décor. Learn more about digital window displays and how they can improve customer experience just in time for the holidays. Did you know, according to Nielsen Media Research, businesses with digital signage displays can see a 33% boost in sales? 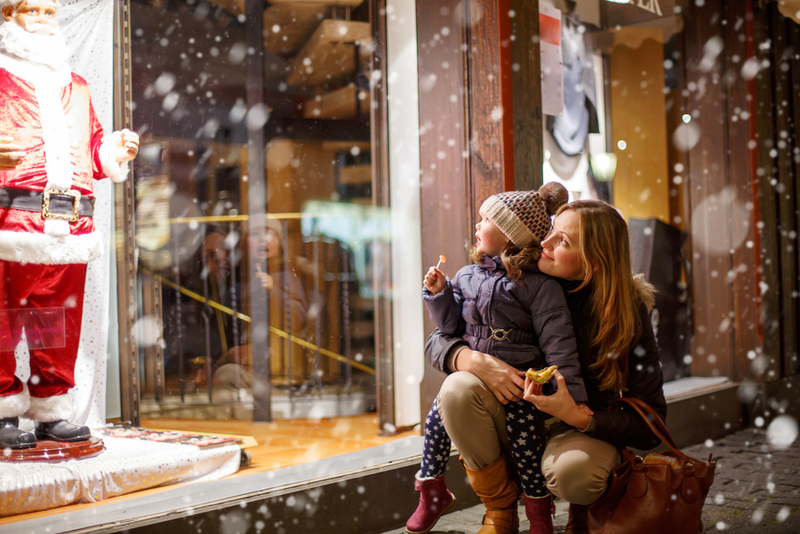 Check out 5 other ways they can keep your customers happier during the holiday season. Waiting in line to check out during the holidays always takes longer. More people shop during the several months leading up to Christmas and Hanukkah than anytime the rest of the year. No one likes waiting in line during the holidays with so much else to do. Keep your customers from getting frustrated during popular store hours by installing a digital signage display near the checkout. You can play a holiday movie to get them in the mood or a music video to distract from their wait. The gift of giving first requires a lot of browsing and shopping. That means customers spend more time in the store figuring out a great gift, not just buying and checking out as fast as possible. The browsing comes with questions and what happens when all your retail associates are occupied helping other customers? Often a customer with a quick question about an item or sale does not want to wait around, especially during the holidays. Digital displays featuring item descriptions and sale breakdowns eliminate this issue and ensure your customers get the information they need without having to wait in line to ask. Digital window displays facing the outside of your brick-and-mortar business catch the eye and draw in customers from the street. Display the latest sales or in-store happenings to let people walking by know they should stop in. Since digital displays move and change, they capture the interest of people passing by both physically and visually to pull them into your store. Use a digital signage display to provide product features and/or benefits to customers without wasting money printing new signs for each sale. You can also boost sales by cross-selling or upselling on the digital display without needing to invest in more staff. The digital signage can promote sales packages or add-ons as well as offering recommendations to encourage customer purchases. Printed signs offer very limited space. Digital signage displays never run out of room since you can simply scroll through several different images. Take advantage of this extra space to share your business’s story and solidify your brand impression. Adding digital signage displays in your brick-and-mortar retail store does more than just keep your customers happy. It acts as free advertising for your business and increases your sales by making your customers want to come back for the experience. Ready to explore other ways boost sales and widen your pool of potential customers? EcoDigital Media in Portland, Oregon has the best solutions to all your digital signage needs. From in-store video walls and custom content online to subscription services and SMS campaigns, the experts at EDM are ready to help your business!